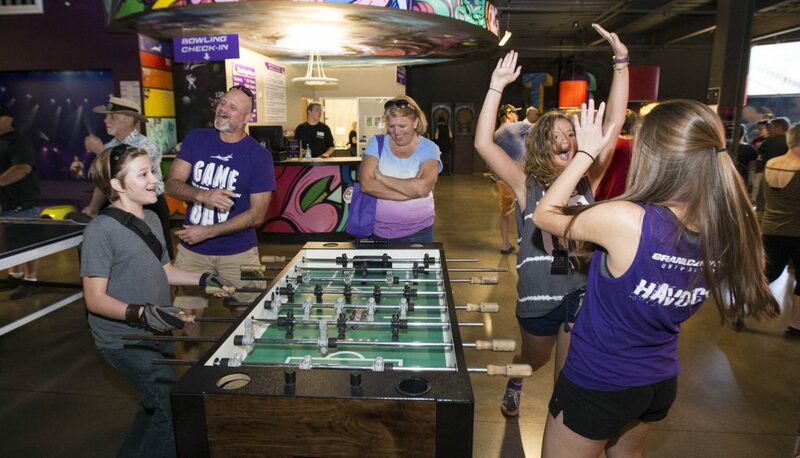 GCU students, their parents and siblings drop into the Thunderground for Family Weekend in 2016. So how many purple GCU T-shirts, striped pajama pants, spirit bows, hoodies, mini basketballs and water bottles can your mom or dad load into a shopping basket in 1 minute? No one knows for sure, of course, but suspicions are strong that they can do A LOT of damage and load up the SUV with enough purple to last their GCU child’s four-year career. About 2,500 families have registered for Family Weekend 2017. The Lope Shop shopping spree at 1:30 p.m. Saturday, appropriately dubbed the Thunder Bolt, is just one of the frenzied activities that will occupy the three-day, jam-packed Family Weekend Friday to Sunday on the GCU campus. Participants must be checked in for Family Weekend at any of the check-in booths, with one parent/guardian selected for each prize. It isn’t the only thing going on, of course. Another featured event is a fall festival that will pepper the campus. The College of Fine Arts and Production, which is in the midst of rehearsals for Moliere’s “Tartuffe,” will be at the festival doling out some performances. Tale has been told of the ultrapopular Midnight Madness on Friday, when the University kicks off the basketball season with much ado (it’s so popular that the 300 tickets reserved for families for Family Weekend have been taken). The pumped-up, electrically-charged, fan-frenzied to-do will be pirate-themed this year, with the event spilling over into the early-morning Saturday hours. In addition to an intrasquad scrimmage, expect a show – and by a show, the University means a show, complete with pyrotechnics and blood-pumping music. Men’s basketball coach Dan Majerle has even made a grand entrance via a chopper motorcycle in the past. Not that Midnight Madness festivities will dissuade anyone from waking up Saturday morning, maybe not so bright-eyed and bushy-tailed, in order to attend yet another popular event of the weekend, when President Brian Mueller delivers a Chapel message at GCU Arena. 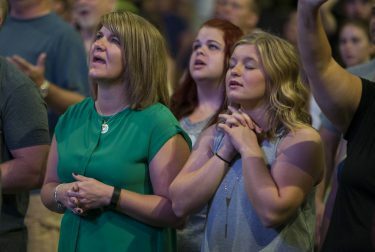 Parents attend Chapel with their GCU students during Family Weekend 2016. Also look for a nine-hole shotgun golf tournament (the tournament has reached capacity) and a cheer and dance clinic – both made their debut last year – along with bowling, walking tours, a family kickball tournament, a slew of club athletic games, a movie on the lawn (“Despicable Me” Friday night on the Grove lawn), and even a concert Saturday night at GCU Arena by Christian artist Jeremy Camp. About 2,500 reservations have been made for Family Weekend, which translates to about 4,000 expected to participate in this activity-filled convergence when you count parents – moms and dads of mostly freshmen and sophomores — and other family members. “We had no idea we’d have so many registrations by phone,” Lind said of taking phone registrations after online sign-up had closed. That doesn’t include the volunteers, from the small but dedicated Parent Council to about 40 Canyon Christian Schools Consortium members who will be out and about for Saturday’s Thunder Run Family 5K. Family Weekend has grown every year to match the tremendous growth of the University. In 2008, GCU was home to about 900 students on campus; today, that number is about 19,000 students. One of the activities for Family Weekend is the Lil Lopes Cheer and Dance Clinic. It’s a chance for the University to not only showcase athletics and various organizations, but restaurants, arts and spiritual life, and new construction – a peek at things yet to come for the campus. 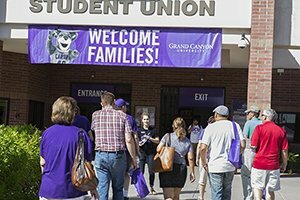 The goal is simple: to embrace parents into the GCU community. While online and phone registration has closed, walk-in registrations are welcome, with payment taken at check-in. 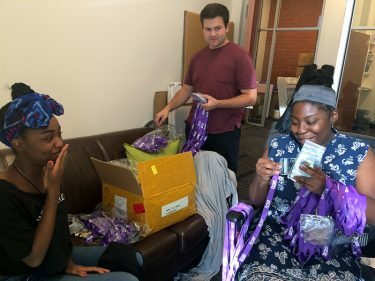 Jada Ward, Caleb Palmen and Danaysha Smith (from left), student leaders for Lopes Connection Crew and New Student Family Programs, spent a few hours Tuesday afternoon putting together hundreds of welcome bags for Family Weekend Friday to Sunday on the GCU campus. 7:30 a.m.: Nine-hole shotgun golf tournament (the tournament has reached capacity). 7 a.m.: Thunder Run 5K, north side of Building 26. Check-in starts at 6 a.m.